My first show in a library, what a great venue! The presentation elaborated on the real world foundations of classic horror using examples from my collection as visual aids. The audience was around 20, for the library that was a full house! 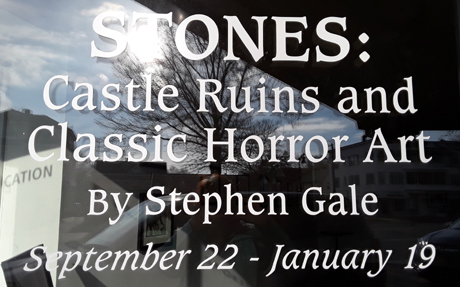 My home town of Springfield, MA has sponsored a ComicCon event since 2012 hosted by the arts center that exhibited stones in both their galleries. How could I not get a table? Estimated 500 attendees but I made my first 4 sales! 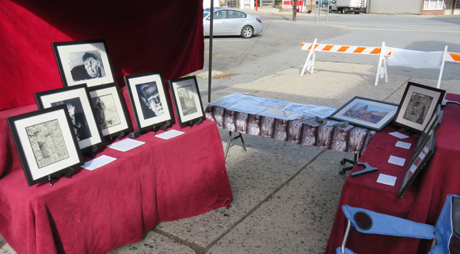 The Atelier Rosal frame shop and gallery in Rahway, NJ hosted Samhain, named for the pagan precursor to All Saints and All Souls Day and ultimately Halloween. I was able to put together five pieces for this one. The building that was my local movie theater as a kid, before the area's first mall or multiplex, is now an arts center with 2 galleries. stones occupied both - castles on the left, monsters on the right. My first juried show, 98 pieces of art were accepted from 232 submissions. All three of my entries made it into the show with Sun of Frankenstein and Hobbit Crossing both winning bronze achievement awards. 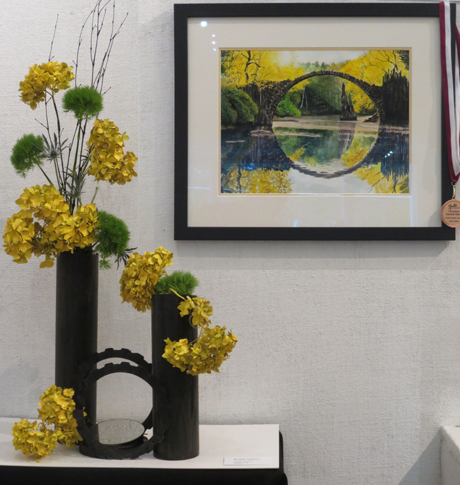 Additionally Hobbit Crossing was selected by Bev Scaff of a group called Floralia who, among other things, create floral arrangements inspired by works of art. Here is what Hobbit Crossing made her see - I just love it! Belvidere, NJ's first annual art fair. Mill street was blocked off and 5 artist set up tents. The 7 hour event saw a steady stream of visitors. I didn't sell anything but this one worked out really well as an exhibit. Folks love talking about this stuff! 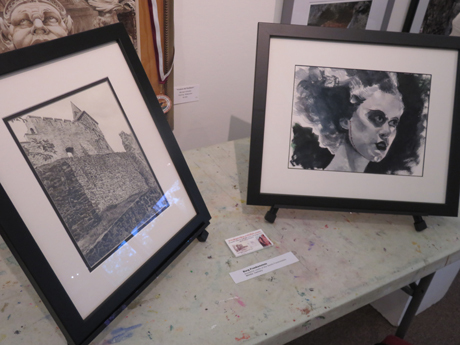 The first full collection was exhibited late in 2017 at The Hive in Chester. 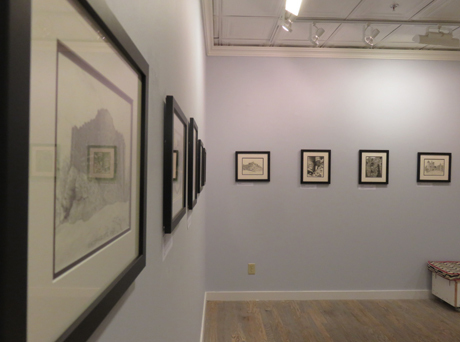 A total of 30 pieces - 14 classic monster watercolors, 13 castle ruin pencil renderings and 3 castle ruin watercolors filled the entire gallery space. The Nova Initio Foundation arranged for a 6 week exhibit at the Walsh Gallery of Seton Hall in Orange, NJ on display from Thursday, October 19 thru to December 8, 2017. 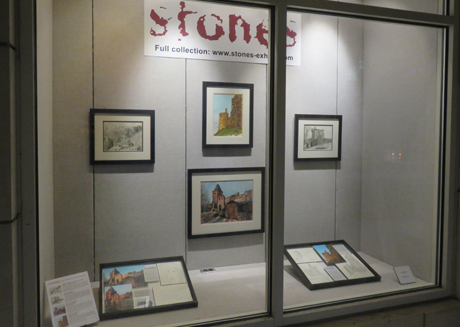 2 pieces from the stones exhibit were displayed along with 2 collages depicting the progressive steps in developing 2 pieces that wove in elements environmental to the subject matter. The Nova Initio Foundation arranged for a one day exhibit at the Guild of Creative Art in Shrewsbury, NJ on Saturday, October 7 as a fund raiser for the foundation. 12 pieces from the stones exhibit were displayed pairing real life locations with fictional monstrosities. This was the first time pieces from the stones collection were displayed publically.